NIRVANA "Love Buzz" b/w "Big Cheese"
The ultimate Nirvana vinyl rarity, in excellent condition. A near-perfect example of this mega-rare record! Obtained directly from Sub-Pop label co-owner Bruce Pavitt in 1992. NOTE: ONE OF ONLY TWO DOCUMENTED CASES OF A "LOVE BUZZ" DUPLICATE NUMBER !! The other is #235, which was donated by Bruce Pavitt to a charity auction in 2005. An original first pressing, it carries the hand-written number "233"/1000 in red. The vinyl looks great, super-shiny with no fingerprints. Any flaws? Nothing major. There is a small L-shaped scuff (app. 2-cm) at the beginning of the A-side. A tiny surface scratch (3-mm.) is visible towards the end of the side. The B-side has an extremely light surface scratch (2-cm.) in the runout groove area, not even on the playing surface. Any of these minor flaws could have been there since manufacture and are barely perceptible. I played the record once on a quality turntable and -- beyond expected light pops from sleeve dust during the 10-second sound collage intro -- I heard nothing wrong with it. An excellent sounding pressing, once the song kicked in it played LOUD, STRONG and FULL with no playback distortion. The tonearm displayed a mild shimmy as it spun, but nothing that registered audibly. The labels have no fingerprints or spindle marks and appear untouched. Flawless. The sleeve is pristine with neat corners and no evidence of handling, just the expected mild round imprint from the record itself, but no perceptible ringwear. I now keep the record separate from the sleeve to keep it nice. It has never had a price sticker, so no leftover sticker goo. Includes original white paper inner sleeve. Seriously, it looks like it just came out of the shipping box from Sub-Pop... 22 years ago! "My record store (Atomic Records, Milwaukee, Wisconsin, USA) ordereddirectly from the label so I begged our sales rep to find me a copy. I received afax from Sub-Pop co-owner Bruce Pavitt which read 'the band currentlyhasabout 7 million fans worldwide so... $200 is the best I can do. Think of it as an "investment".' "
In addition, Love Buzz List added the comment: "there are two documented cases of copies with the same number, this one and #235." 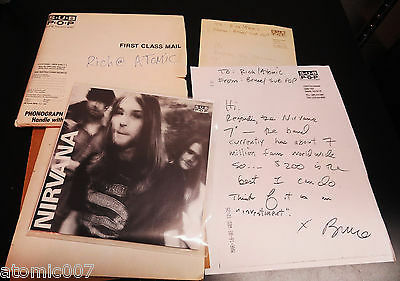 1) The original Sub-Pop shipping sleeve, hand-addressed to "Rich @ ATOMIC", mildly yellowed with age. 2) The original thermal fax from Sub-Pop -- dated March 18, 1992 -- with Bruce Pavitt's offer to sell. It is severely faded and yellowed with age (see main photo, upper right) but I had the presence of mind to make a legible copy at the time of transmission, which is also included. To be absolutely clear, this auction is for the Bruce Pavitt-owned #233 copy of "Love Buzz", not the pair of #233s. If you so desire, it is up to you to track down the other #233! Free shipping in USA, registered with insurance, signature required. International Buyers Please Note: You must abide by terms of the eBay Global Shipping Program. I realize this adds a substantial cost but without the safeguards offered by the program I would be unable to make the record available outside of the United States. I hope you understand. I recently sold another "Love Buzz" in similar condition for over $2100 with a reserve of $1000. Due to the rarity and pedigree of this duplicate number copy I have set a higher reserve, but it is still under $2000. Thank you for reading this far. Please let me know if you have any questions.